Bengaluru: The Congress that was hoping to give a tough fight to the BJP in Bengaluru Central Lok Sabha constituency is bracing up for an internal conflict with two senior leaders eyeing the same seat to contest. 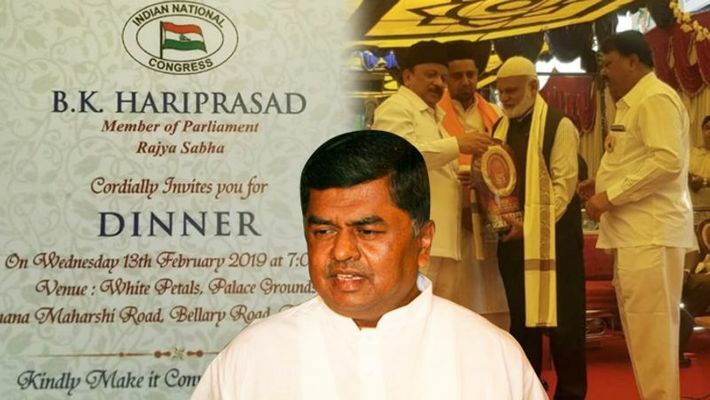 While Roshan Baig, a former minister and seven-time MLA is making efforts from the last one year by hosting religious meetings and attending functions of other minorities like Christians, Linguistic minorities Tamils, Telugites, and Malayalees, BK Hariprasad is hosting dinner. Hariprasad unsuccessfully contested from Gandhinagar in 1983 and later became a Rajya Sabha MP. Speaking to MyNation, Hariprasad said, “I am one among the aspirants. The minority leaders are also expressing willingness to contest. For Muslims, the party also had asked them to contest from Mangalore, but they declined. The minority leaders like Zameer Ahmed Khan and KJ George are from same segment, the BJP candidate can be easily defeated. I know Baig is also in contention. I am also making rightful demand." Hariprasad views are that the seat is winnable as long as there the Congress candidate gives a tough fight to sitting BJP MP PC Mohan. The segment has eight MLA Assembly constituencies, two are reserved for SC, four have significant presence of Muslims and Christians and Tamils and two are Vokkaliga and Lingayat dominated. "From Bengaluru, minorities like Muslims and Christians have been given tickets earlier. It was only Jaffer Sharif who made an impact during his tenure as the Railway minister. Now I am willing to contest. It is left to the party to decide who to pick, one point programme is to defeat the BJP," Hariprasad stressed. Baig who seems to be upset with the party for having him left out of the HD Kumaraswamy Cabinet in the coalition government, said that he now wants to focus on central leadership. "I don't want to comment of other aspirants as I am preparing from my end. I have been meeting people from neighbouring Assembly segments and my equations with linguistic minorities are good. If I get a ticket, I will defeat PC Mohan," Baig exuded confidence. Amidst uncertainty in the Congress, the BJP sensed another opportunity for its third straight win as the Congress leaders have many aspirants and may secretly scuttle each other's growth. "This fight between the Congressmen is a trump card for us. Riding on Narendra Modi wave, the BJP will win 100% for sure," said S Prakash, Karnataka BJP spokesperson. Meanwhile, Subhan Sharief, secretary Al-Ameen Group of Institutions, who was felicitated on Sunday at a minority community traders meet pitched for Baig’s candidacy saying he can appeal to Muslim and Christians in Shavajinagar, Sarvajnanagar, Chamrajpet, Gandhinagar and Shanthinagar. Little effort in other MLA segments will surely send him to Lok Sabha from Bengaluru Central, he said. "Hariprasad is Rajya Sabha MP. He is no doubt a big leader in the Congress but the local sentiments are with Baig," said Sharief.